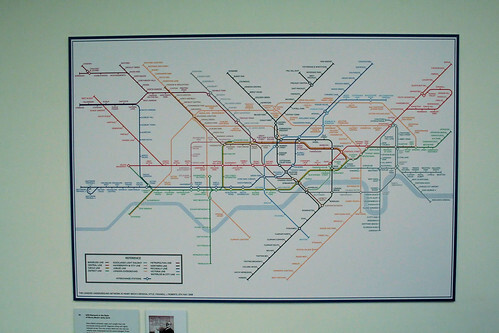 Imagine for a moment if the familiar tube map didn’t have to look the way it does today. How could it look if we sat down and gave it a fundamental rethink? 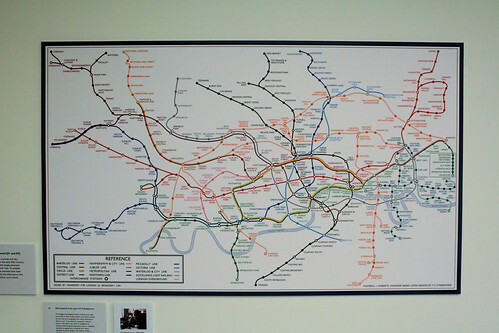 That question is the long running obsession of psychologist, Dr Max Roberts who has given the familiar tube map a makeover and put on occasional displays of his work. 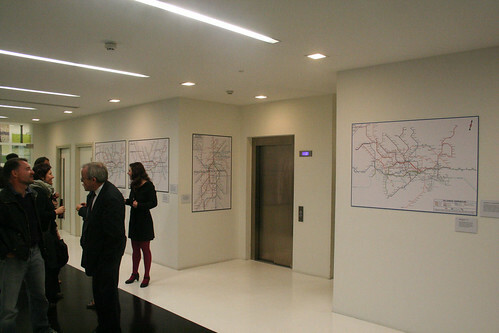 Although the maps have been on display elsewhere before, for the next couple of weeks they will be making their first ever appearance in London itself, giving Londoners who are terrified of leaving the confines of the M25 a chance to see his ideas up close. 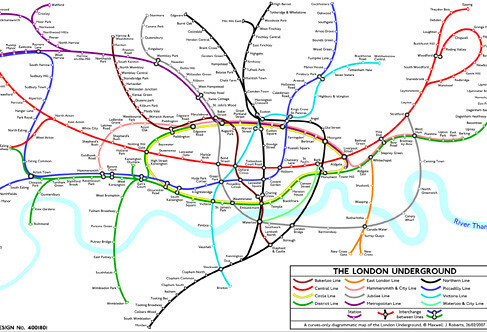 At the heart of the work is subtle, but equally radical – a simplification of the angles that the tube lines follow. The classic schematic map designed by Harry Beck in 1931 insisted that all lines ran either horizontal, vertical or at a 45 degree angle. All very familiar, and still largely followed today. What happens if you change the angles chosen though? Surprisingly, a simple change as that can make the map seem a lot easier to use, if initially a bit disconcerting. …to recreations of the modern network if it were laid out in a pre-Becks style. One map which looks oddly good if totally unusable puts East at the top instead of North. Curving the Northern Line down the side seems to shrink London to a much smaller city and make the tube lines seem more densely packed. It is these oddities that fiddling with the map can sometimes show up. One map which I thought was very interesting is one where the distances between the stations is reflected more accurately. 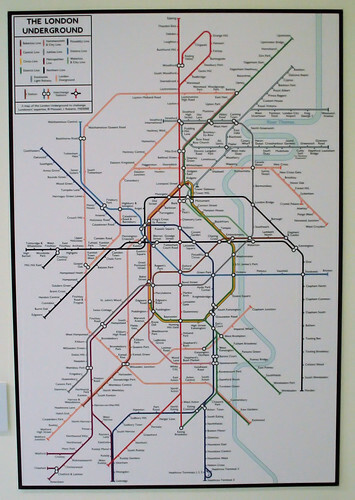 Although it still scales in the same way as the modern Beck-style map, the stations are reflective of the journey time between them. A few others, such as the Rennie Mackintosh map are visually pleasing, if impractical in function. Do notice though that the Central Line is in blue – the colour it had between 1908 and 1933 – not red that we are familiar with today. Another thing to note is the different ways the River is displayed on the maps, from chunky blue lines to more subtle pale threads. Would be interesting to see each map with each different river scheme and see what impact that has on the maps legibility. 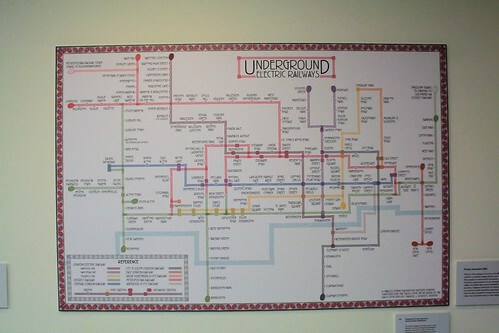 The big question that I am sure most people will want to know, is London Underground looking at his maps and thinking about them? Well, after the fuss caused by the removal of the River Thames from the map last year, would you want to be the person who agrees to a radical redesign of the map layout? I promised not to say what it is, but there is a mistake on one of the maps that was only noticed last night – so you’ll have to spend quite some time to see if you can find it yourself. Assuming he doesn’t get a corrected version made up over the weekend. The exhibition is only a sample of the maps that Dr Roberts has devised, and there is talk of a possible larger exhibition taking place in London, but on the off-chance that doesn’t happen, you might kick yourself if you miss this teaser. A few more photos over here. I didn’t photograph every map on display, and a computer screen can show the ones he hasn’t brought along with him. Diamond Geezer was at the event last night as well – he had also visited the exhibition when it was down in Southend on Sea. The exhibition is FREE, but only open Mon-Fri 10am – 6pm, which is a bit awkward for most people. However, it does have a late night viewing on Thursday till 8pm for those of us who can’t get away during the working week. Your mission is to get to the gallery at Scott Brownrigg, 77 Endell Street, Covent Garden, WC2H 9DZ before Friday 22nd October. Thanks for showing these. I missed the exhibition when it was on, so it’s really good to be able to see. 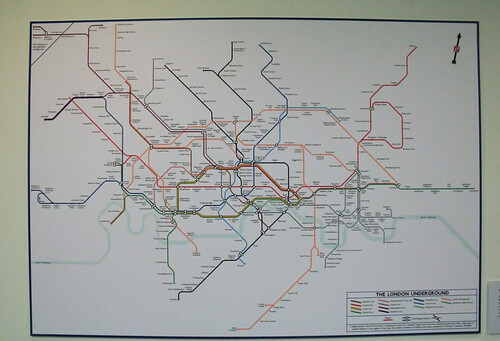 2 Pings/Trackbacks for "For 2 weeks only – alternative tube maps on display"